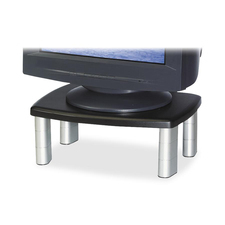 3M Monitor Stand for CRT & LCD - Up to 80lb - Up to 21\" CRT - Silver, Black - Welcome to TABS! Stacking columns raise the machine and allow storage space underneath to maximize desk space. Adjustable monitor stand with nonskid base is designed for laptops, monitors and printers. Stacking columns raise the machine and allow storage space underneath to maximize desk space. Monitor stand supports up to 21\" or 80 lb. and is adjustable in three height increments. Country of Origin: Taiwan Taiwán Depth: 12"
Form Factor: Freestanding Independiente Height: 2.8" 5.8" 5,8"
Material: Polystyrene Poliestireno Maximum Adjustable Stand Height: 5.88" 5,88"
Maximum Load Capacity: 80 lb Maximum Screen Size Supported: 21"